Scenography for Hermès’ new brand. 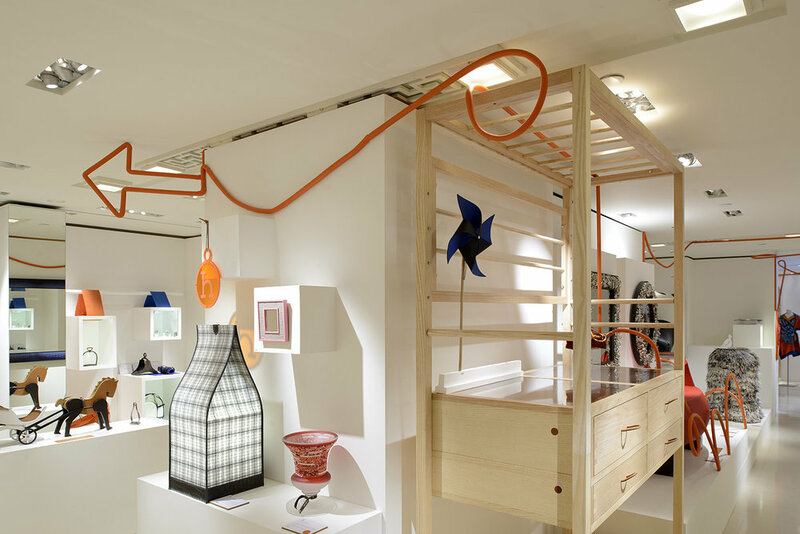 Petit h is a project by Pascale Moussard, creative co-director of Hermès. Concerned about the amount of rejected material generated by the house, Pascale created Petit h (in contrast to the “big H”) to reuse wasted leather, ceramic, and other materials. These are entrusted to designers, who create one-off or limited pieces that are sold in a single city each year. For the Singapore edition, we re-made the Liat Towers store as a series of white volumes, which playfully responded to the dimensions and characters of the various objects. At the same time, a line of orange (representing the spirit of the youthful sub-brand) wound its way through the exhibition, interacting with the various product displays in an irreverent and amusing way.